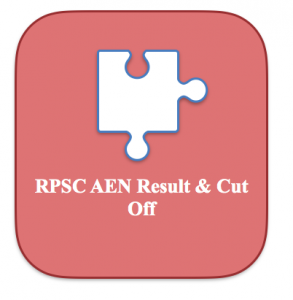 RPSC AEN Result 2018-2019: Rajasthan PSC Assistant Engineer Result 2018 & Cut Off Marks for AEN Previous Years are todays topic. If you are preparing for the RPSC AEN Exam 2018, you must know the important of previous years cut off marks. With the help of it you can guess RPSC AEN Expected Cut Off Marks 2018 for Civil, Electrical, Mechanical Engineering. The RPSC AEN Result 2018 publishing date is yet to be made public by the Public Service Commission of Rajasthan. Written recruitment test for the post of Assistant Engineer in various discipline will be conducted soon. The result of Assistant Engineer recruitment examination conducted by Rajasthan Public Service Commission will be released shortly after the test. The date of conducting the test as well as publishing the result has not been announced yet. Therefore the candidates are suggested to keep checking the website rpsc.rajasthan.gov.in at regular interval to get all the updated news related to the recruitment process at the right time. The recruitment authority of Rajasthan Public Service Commission will prepare Merit list for shortlisting apt candidates for the post of Assistant Engineer. The selection will undergo a number of steps- Preliminary Examination, Main Examination and Viva-voce examination. At first there will be Preliminary Examination that will have 2 papers. Paper-I will be compulsory for all the posts and contain questions from General Knowledge and General Science. Paper-II will be optional and the candidates have to choose any one paper from the following discipline – Civil, Electrical, Mechanical and Agricultural Engineering. Each of these papers will contain 200 marks. This test is going to be a screening test and and only qualifying in nature. Check RPSC AEN Previous Years Question paper Downloading Link here. Then there will be Main Examination that will be conventional type. There will be total 4 papers and bear 600 marks in total. The candidates acquiring qualifying marks in Main Examination will be called by the Rajasthan Public Service Commission for the Personality Test and Viva-voce. The marks obtained in the Preliminary Examination will not be considered while preparing the final Merit list. The marks obtained in Main Examination and Viva-Voce will be taken together for the selection of Assistant Engineer. Furthermore we would like to conclude with the fact that the result of RPSC Assistant Engineer recruitment process will be uploaded to the website of the commission at the right time. The scorecard for each of the subjects will soon be released and the contenders can check it roll wise and name wise. If you face any problem while checking the merit list, you must contact the RPSC Authority. Assistant Engineer 2014 Exam Interview Result – Click here. AE 2013 Final Marks – Click here. The qualifying marks for each of the compulsory papers of the Main Examination as declared by the Rajasthan Public Service Commission for the selection of Assistant Engineer is 35%. Obtaining 40% marks in aggregate will also be compulsory for the selection of the candidates for the Interview round. Overall 50% marks must be scored in aggregate (considering the marks of main examination and viva-voce) to get appointment for the post. General / UR / OC : 50% (Total). For OBC and SC / ST / PH Minimum Qualifying Marks have not been given. Exam Date – From 28-05-2014 to 31-05-2014. Go to the link which will be provided below. Thereafter, you will see a form. Enter your detailed particulars in the form. After that, you will be able to know whether you have been qualified or not. So, after you get all the info here regarding cut off and RPSC AEN Result 2018-2019 publishing date, do prepare more with the help of our Free Study Material and also subscribe us at www.jobsandhan.com.